First, it was honey I shrank the football field. Then many, many years later in the David Copperfield era, it was as though the master of illusion himself played the trick of his life and made the football field disappear altogether. When I was a college freshman back in 1975, DLSU still had a decent-sized football field. The goal at the western end of the field, as a matter of fact, was located almost at the edge of the walkway that people used to get from the gym to the college cafeteria. In those days, the library was still at the ground floor of the St. Joseph’s Building; and there were glass doors leading into the library from the walkway almost dead center of the building. I would occasionally watch the noontime varsity training sessions and could see that the glass doors were always in danger of being hit by an errant shot from the football field. One day, young people in the university will not know nor care that there was once a football field underneath the Henry Sy Building. Time by its very nature buries in forgottenness memories that people fail to write. I did not join the football varsity until schoolyear 1978-1979. Boys being boys, some of my teammates would sporadically hold shooting practices at the western goal. If anyone watching was beginning to wonder why the balls kept sailing above the crossbar, well, that was because the real target was the glass doors of the library behind the goal. I might have taken a shot or two myself. Relax. Nobody broke the glass doors. 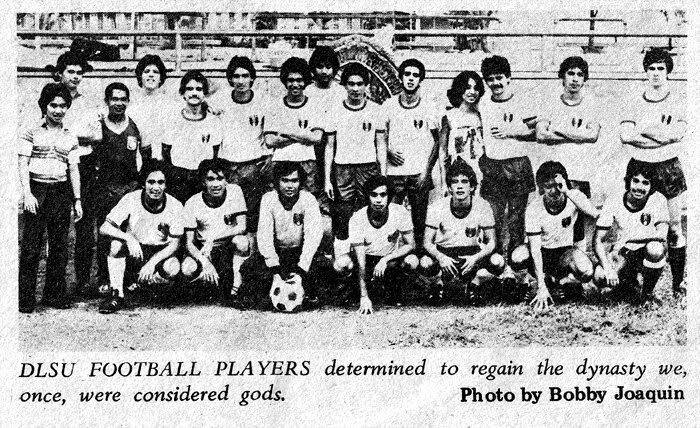 In the first semester of schoolyear 1980-81, we were told by our coach Baltazar ‘Dima’ Dimasuay that a new building was to be constructed along the northern edge of the football field behind the college cafeteria. One day the construction workers arrived and started to put up a wall made of flimsy thatched materials from one end of the field to the other just a few yards past the northern posts of the two goals. The wall cordoned off the construction area. For all intents and purposes, our football field had been halved along its length. The sixty-four dollar question was, where would we train? It was a question quickly answered by Dima himself. The game of football is replete with stories of greatness and heroism; but few will come close to matching the sheer bravado of the football team that trained and scrimmaged on half a football field. To say that it was difficult is to understate what it was like. Not only did we feel cramped inside the narrowed space; there was also only one wing to spread the game to and play, naturally, became predictable. And when the ball crossed beyond the thatched wall and into the construction site, whoever had the misfortune to miskick it had to be momentarily excused from the match so he could fish the ball back from the construction site. That building that was under construction would later become the Velasco building. We told a teammate who was sometimes slow to pick up on the sarcasm that the building was being constructed to become athletes’ quarters; and that we had already chosen our respective rooms. He believed us. But he was such a nice guy that we soon relented and told him the truth. As the NCAA season came closer, thankfully we were told that we would be using the Rizal Memorial Stadium for our training sessions. Unfortunately, I went down with hepatitis and had to be excused from training for a couple of months. Nonetheless, I joined my teammates for the thrice a week short trek to the stadium and watched them train. We preferred the shortcut through Leveriza from the back of the campus. There was no danger from the people in the slum area behind the university because they were so used to athletes coming and going. The short walk to and from the stadium, however, could be anything but mundane. It was not uncommon to see a boy or girl with hands holding onto the rails that lined the creek defecating into the water as though it was the most natural thing in the world to do. And one day a grown man with his pants pulled down doing the exact same thing and totally oblivious of the people passing by. It felt intrusive to even have to walk past him; and I believe that we all just politely pretended that he was not there. By the second semester, the football field had been restored. Well, somewhat. The goals had been brought closer together to make way for tennis courts built in front of the St. Joseph’s building and for a foot path along the Taft Avenue fencing. Even the new Velasco building had eaten up some of the real estate so that the dimensions of the football field decreased along both its length and width. From the wide open spaces of the Rizal Memorial, it felt odd to be playing on a field that did not even seem to meet the minimum dimensions mandated by FIFA. But it was our home field; and although it felt way too cramped inside for good football to flow, it still felt great to have it back. Regrettably, we could not wrest the NCAA football title from Mapua on this my last year in college. I honestly felt that we were strong enough to do so. However, the semi-finals and final were scheduled on the weekend right after final exams week. Those of us in the team who were free during that week got together in small groups to train by ourselves; but the entire team could not train together the whole week. We were still too strong for San Beda in the semis; but the problem was that the final was also right the very next day. It was the sort of anti-sport scheduling that was all about getting the season over with no consideration given whatsoever to players’ recovery time. Because we hardly trained the week before, it was always going to be something like setting out on a road trip with the tank only half-full. There simply wasn’t enough gas left for the return journey; and so we finished bridesmaids to Mapua for the second straight season. Three decades later, I was naturally upset when I first heard that a building was going to be erected on my beloved football field. But I have also been in management and know that, sometimes, there is no recourse but to sacrifice sentimentality for progress; and more so in a relatively small campus like DLSU’s. That is why I write this piece for whoever cares in the future to know that there was once a football field underneath that tower of stone; and that despite the football field being halved and later shrunk, young men like I once was continued to come for love of the beautiful game. And inside the heads of those who played there, the football field continues to be unobscured by the building that has taken its place. What for is a football field without young men to chase that round black and white thingey? In my time at the university, I had the greatest honour and pleasure to have worn the green and white with these gentlemen, in no particular order: Tommy Mirasol, Chu Lazaro, Monchu Garcia, Anton Garcia, Alan Muňoz, Ronnie Joseph, Edward Wuthrich, Joselu Gonzales, Gene de los Reyes, Leo dos Remedios, Rene Medina, Julen Goitia, Danny Huang, Joey Huang, Rey Ferraren, Alfred Paterno, Victor Brias, Martin Kaufmann, Kiko Picornell, Jojo Nicomedes, Harvey Campos, Paul Tang, Paul Zuluaga, Junie Villamejor, Jose Mari Prats, Nacho Prats, Venancio Dolar, Razlan Saba and Gonzalo Valdez. Apologies to those whose names I cannot recall. Memory is a right old hag after three decades.